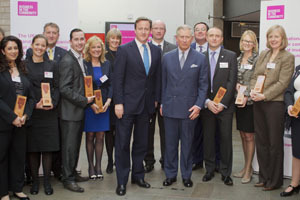 It got very busy when the Prime Minister David Cameron met HRH Prince Charles for BITC’s Communities Summit at The Roundhouse – Number 10 entourage meets Clarence House entourage – my most useful piece of equipment in the camera bag was my roll of black gaffa tape (yes I know, that links to Clerkenwell Screws, a manly place for manly men who know the right terminology for bits and things and who’ll never need a website). I had less than 10 seconds to get this group shot but most of the morning to set it up. I marked out on the floor where the BITC delegates should cluster and stuck down marks on the floor as indicators for where they should leave gaps for the PM and HRH (you can just see the tape on the floor by their feet). It all came together like a well oiled flash mob, then they departed in different directions moments later. Job done though.